Morocco, with Rabat as its capital, is situated on the eastern coast of the Atlantic Ocean and the southern coast of the Mediterranean Sea, bordering Mauritania, Algeria, and Spain, although the Mauritanian and Algerian frontiers are contested, as they incorporate the territory of the former colony of Spanish Sahara, or Western Sahara, as its liberation movement calls it. Morocco’s surface area is 446,550 square kilometres, making it roughly the size of Iraq or California. 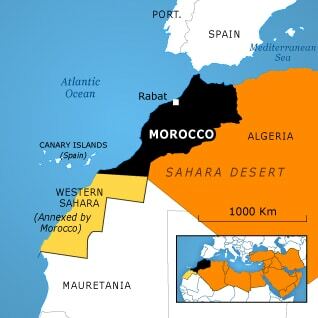 Occupied Western Sahara included (266,000 square kilometres), its surface totals 712,550 square kilometres. Morocco’s population was 32.2 million inhabitants in 2011 (World Bank). The main language is Arabic, and Berber (Tamazight) is also an official language. French is widely spoken. Nearly all Moroccans are Sunni Muslims, of the Maliki school of law. Officially, Morocco is a constitutional monarchy with a multi-party system, governed through the bicameral National Assembly. The Constitution states that Islam is the state religion but guarantees religious freedom. The head of state must be a Muslim and a member of the Alaouite family.